We are glad to announce that the United Reggae production competition winner song is out now on vinyl and for digital download on April 8th (pre-order available on March 31st)! 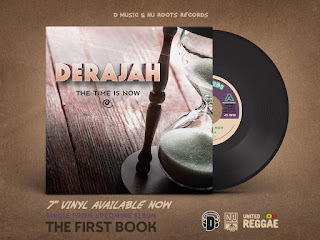 Jamaican singer Derajah recently won global reggae magazine United Reggae’s production competition with his song The Time Is Now, which has been mixed by UK’s Daniel Boyle and was just released on his D Music label, distributed by Nu-Roots. At the same time Derajah prepares for his second album – The First Book. 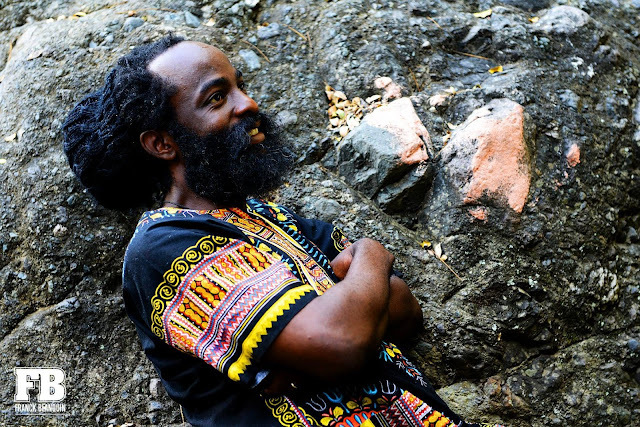 Derajah has recorded since the early 2000’s, but got his big break when he started working with legendary guitarist Earl “Chinna” Smith and his music collective Inna De Yard. His debut album Paris is Burning - released in 2011 - was however recorded with French band Donkey Jaw Bone along with a few Jamaican musicians. Since the release of his debut, Derajah has worked on a number of projects, including his brand new song The Time is Now, which last year won United Reggae’s production competition and got mixed and dubbed by Grammy-nominated producer and mixing engineer Daniel Boyle, who has previously worked with artists such as Lee “Scratch” Perry, Max Romeo, Sylford Walker, Winston McAnuff, Oriel and Rosa Shanti. The songs on the new album are produced by Derajah and recorded at his home in Kingston and in various domestic and international studios. The Time is Now is available now on 7” and digital download with a dub version – Dub is Now – by Daniel Boyle. “Daniel Boyle mixed the song the way I had anticipated it. He is one of the best engineers I have worked with. It’s a work of art – the composition, the instruments, the vibes, the love, the tears and the joy,” says Derajah. The artwork on the single was made by Jess Clarke, who wanted to put forward a mystical side. “I focused on the divine light, which illuminates the scene, and Derajah’s name. And blurred the side for the hourglass to illustrate the passing of time. The symbol below the title is the spiral of time, the infinite movement. Time is short, but it is eternal,” says Jess. Derajah would like to thank Daniel Boyle, Anais Goasdoue, United Reggae team, The Viceroys, Daniel McCauley, Samory-I, Jah9, Debo Ras, all Inna De Yard team, fans and well-wishers in radio, print media and bloggers. "Big respect to Timothy “Quik Keys” Kahwa, great engineer! Before I leave, I must say big respect to my family, my wife and child for their continuous support and love. The time is now, give thanks." Musicians involved in the project include Damian Gordon on bass, Ras Boris Milchev Nenov on drums, keys, organ and clavinet and Deraja Mamby on percussion. Available on 7" vinyl now and for digital release on April 8th. Jamaican singer Derajah has made well-over 100 live performances and cut hundreds of recordings. He is an open- minded and versatile artist always bringing his roots and conscious style to every studio he visits. He is an artist that possess a particular voice, a voice with a mystical touch that can transcend musical borders. Deraja Mamby was born in Kingston, Jamaica, and spent some of his formative years hanging around musical hotspot Chancery Lane, a place immortalized by a number of reggae songs over the years. His father was a Rastafarian and his mother was a church-going Christian, an upbringing which allowed Derajah to an equal amount of exposure to both secular and sacred music, but also provided a supportive environment of acceptance to follow his own spiritual path. His talent was spotted in 2002 by singer and producer Sugar Minott, for whom Derajah recorded his first single Righteousness Just a Flow. Derajah recorded several songs with Sugar Minott, songs intended for an album, but the plans weren’t materialized because the passing of Sugar Minott. Around 2004 Derajah joined Inna De Yard, a music collective headed by Earl “Chinna” Smith, alongside major artists such as The Congos, Kiddus I, The Mighty Diamonds, Linval Thompson and Winston McAnuff. This venture exposed Derajah to an international audience and he also recorded the songs Well Ah Oh and Who Yeah Yah for two different Inna De Yard compilations. During the same time he participated in the documentary Natural Mystic Reggae and cut several singles for European producers, including Makasound (France), Own Mission (France) and IrieVibrations (Austria). In 2007 Derajah linked up with French band Donkey Jaw Bone and began working on his debut album Paris Is Burning, which was recorded at Donkey Jaw Bone's analogue studio in Paris and put out in 2011. Now Derajah is working on new material. The first single off his upcoming second album – The First Book – is out now on 7” vinyl and for digital download. The song The Time Is Now was mixed and dubbed by Grammy-nominated UK producer and engineer Daniel Boyle, who has previously worked with artists such as Lee “Scratch” Perry.